Pop Cauldron is a spooky little game for kids of all ages. Deep in the Creaking Woods lies the secret cove of the mystical Pop Cauldron. Every Halloween when the moon is full and the winds begin to blow through the dry trees, a creepy Jack O’Lantern cauldron appears. 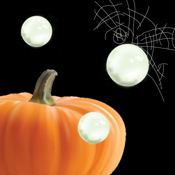 From its murky depths come slimy magical bubbles containing tricks or treats. Time is short... Pop the bubbles to catch the treats and avoid the tricks; or, catch the tricks and avoid the treats; or just catch everything you can! See what the Pop Cauldron has in store for you!